Have you been enjoying this unintentional mini series of Easy Family Favorites? I only do easy cooking, so I thought these recipes might be helpful for any one else looking for some easy recipes! 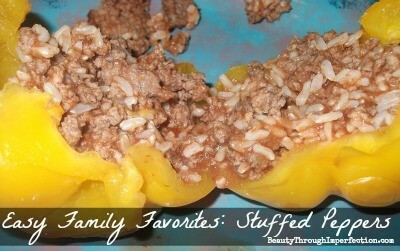 Here’s a favorite that I learned from my MIL, stuffed peppers! Cook Rice according to directions on package. While the rice is cooking remove the core and seeds from the bell peppers (as in the image above). Steam peppers for 5 minutes until slightly softened. Place them, opening side down, on a plate to drain. While the peppers drain, cook the ground beef in a pan with the italian seasonings until browned. When the meat and rice are done, combine them in a large mixing bowl. Stir in the tomato sauce, and cheese and mix until well blended. Place the peppers in a baking dish and spoon the mixture inside until full. Use the spoon to pack as much in them as possible. Back in the oven at 350 for fifteen minutes, let them cool off for a few minutes and enjoy! YUM! These look so tasty! I’m going to pin them to my recipe board on Pinterest! I hope that’s okay?! YUM! I was JUST wanting to find a recipe to use up some of our peppers from the garden! This is so easy! Thanks for sharing! What an easy recipe – thanks! Robert really enjoys stuffed peppers, but I’ve been lazy and bought him the frozen kind. (shhh – don’t tell anyone) This looks like something I could actually do! One word: Yum! =) Happy Wednesday – and thanks for sharing at the Pinterest Power Party! Hi, we love stuffed peppers in my family and I look forward to trying out this. Thanks for sharing and I saw it on Lamberts Lately. I always make stuffed peppers when we start getting lots from the garden. Hubby and I both really enjoy them. I have an easy recipe for a Sweet and Sour meatloaf that is one of our favorite easy meals. Thanks for sharing with SYC. We just love Stuffed Peppers, as a matter of fact I have them on my menu for this coming week. Your recipe looks awesome! Hope you are having a great weekend and thanks so much for sharing with Full Plate Thursday! Great weeknight dinner idea! Thanks for linking up with What’s Cookin’ Wednesday! 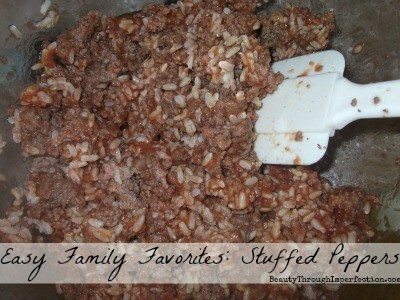 If my kids liked peppers, I would make this in a heartbeat b/c it sounds great! Thanks for sharing at Sweet & Savory Saturdays #27! 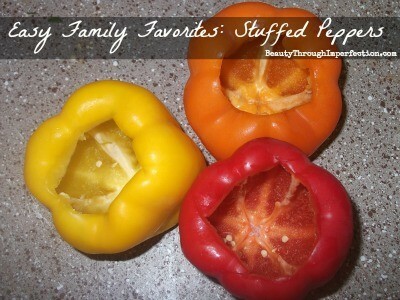 Hey Buddy!, I found this information for you: "Stuffed Peppers – Easy Family Favorites". Here is the website link: https://www.beautythroughimperfection.com/stuffed-peppers-2/. Thank you.